The history of our Parish Faith Community is like that of really any family. Not much is written down. Most of it is in the memories of the people who are part of the family. Therefore, we would ask that as you read this history you keep in mind your memories of the priests, sisters, brothers, teachers, parish workers and members of the community from the past. Anyone having further information about these years of the parish life please contact us with your information so we will update this and other parish history files. The past is important it makes us who we are and helps us continue a tradition toward the future for those who will become members of Our Lady of Mercy Community continuing to keep it "Second to None". 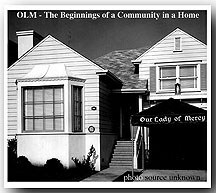 Our Lady of Mercy Parish was founded early in 1954, when Archbishop John J. Mitty designated Father Richard W. Power as pastor and established parish boundaries which embraced all of the Westlake section of Daly City, parts of Broadmoor and other sections to the West of Skyline Boulevard. A rectory was purchased at 692 North Mayfair Avenue and Mass was celebrated in a basement chapel there for the first time on Sunday, May 16, 1954. Five months later a second chapel was established on the second floor of the Medical-Dental Building in the Westlake Shopping District. A total of six masses are now celebrated on Sundays, but many Catholic families still attend services at other churches because of the lack of accommodations. Today there are something over 900 families residing in the parish boundaries, with additional Catholics arriving every day. Two thirds of these families reside in homes, the balance in apartments. During the formative months of our parish, members of the Womens' Club conducted a census of the parish. This project will be carried on as a continuing project. Among the more important blessings showered on Our Lady of Mercy Parish have been the educational services Provided for children of the Parish by two great teaching orders of Nuns, These are the Sisters of the Third Order of St. Dominic, Congregation of the Holy Name, who staff out school, and the Sisters of the Holy Family who provide catechetical instruction for Catholic boys and gifts attending public schools. The Holy Family Sisters fill an important void in their work with public school students. The manner in which these youngsters are prepared for the reception of the sacraments of Holy Communion and Confirmation has been most outstanding. With the observance this month of its third anniversary, Out Lady of Mercy Parish has completed a building program without equal in the 10 year history of the San Francisco Archdiocese. Founded in April, 1954, the first Mass was celebrated on Sunday, May16, 1954. The makeshift chapel in the basement of A temporary rectory at 692 North Mayfair Avenue was reminiscent of the very start of Christianity itself - the Stable at Bethlehem. Five months later a second temporary chapel was established on the second floor of the Medical-Dental Building in the Westlake Shopping District. With Catholic education receiving the highest priority in the parish building plans, construction on a school was started on January 3, 1955. Within 16 months of the celebration of the first Mass, classes were started in four grades in the attractive, modern school. With no pause in the accelerated construction program, work on the erection of a new church commented even before the school building was completed. 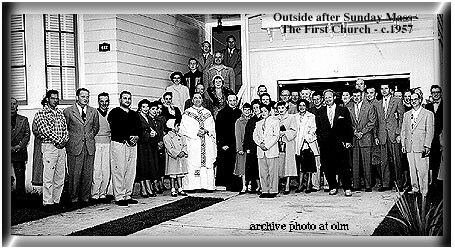 The first Mass in the new church was celebrated on May 27, 1956, little more than two years after Archbishop John J. Mitty had created the parish. A substantial financial debt must be liquidated. Hundreds of our children have not yet seen accommodated in our school. This can be done only through the erection of a second school building. This goal, however ambitious it may seem, remains the all-prevailing dream of Father Power. "Through the devotion and sacrifice of hundreds of families in making and completing substantial building fund pledges, a sizeable portion of our expenses have been met- But the continuing need to lower our debt and end interest payments makes our Westlake Festival an important undertaking. With the help of the same Divine Grace which has flowed so abundantly among us, this intention can be realized". PHASE I - The construction of an eight room school, which is now under way. PHASE II - A temporary church, which eventually will would be transformed into a parish hall. This will be a two-story building, the basement of which will he would be a cafeteria. PHASE IV - The permanent church. PHASE V - A new rectory. In deciding to erect a school first, even before a temporary church, Father Power had followed what most of us readily recognize as a wise course. Pope after Pope has stressed the need for Catholic education, and reminded parents of their obligations in this respect. The Holy Fathers have asked that other buildings be delayed to achieve this useful and practical end. 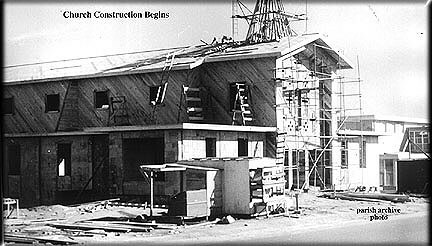 Construction of our school commenced January 3, 1955. It was ready for classes in September. The first scholastic year found at least four and possibly five grades functioning, depending on the availability of Nuns. One class was added each year until the full total of eight were in session. Our school was staffed by the Dominican Nuns of San Rafael, one of the finest teaching orders in the country. At first, they resided at St. Rose Academy in San Francisco. Adding to their regular burdens of caring for our children was a daily round trip of 16 miles between their convent and the school. There are several parishes in Northern California, including long-established ones, which have schools standing idle because of a general shortage of vocations. The Dominican Nuns operate schools where the annual tuition rates are as high per pupil as the amount of the pledge which most of us will make in the forthcoming building fund drive. The school will cost $186,000 to construct and another $20,000 to furnish. It will include eight classrooms and will be expandable. Our architect, Vincent G. Paney, is taking advantage of the latest construction techniques in order to hold our costs to a minimum. The school will be modern, comfortable and adequate, without unnecessary frills. Anyone having further information about these years of the parish life please contact us with your information. This was a time of transition. Father Duggan stayed with the parish for only one year following the death of Msgr. Power. This time in the parish saw continued growth and development of the parish school, the renovation of the church interior under the guidelines of Vatican Council II, the installation of the Rufatti Organ for Parish Worship as well as the beginning of a project of beautification which we now call the installation of the Faceted Glass Windows - Our Parish Art Gallery. Fr. Ryan had a sense of beauty and art which helped make our church something to be both admired as well as a place where a community could gather and pray together. The parish also saw development of fine tradition of education in the Parish School which attained the status of a Five Star School. The Parish Religious Education Program directed by The Holy family Sisters made a transition of leadership to Sister John Minetta who is presently its Leader. Fr. Curso came to Our Lady of Mercy from St. Anne Parish in San Francisco at the time Fr. Ryan became very ill. He helped Fr. Ryan and the Parish during this difficult period of change and transition. Since assuming the role of Pastor, he has undertaken to recap the history of our community, begin building a parish community that has ownership of its identity and is moving toward the Third Millenium with gusto. This tedious task takes much time and energy both in planning. listening and implementing. Various projects and boards have been begun in this process. The whole concept of W E S T Lake as the identity moniker and logo for our parish family comes from a vision of our Catholic Community that presumes involvement, ownership and a community vision that is dynamic. During the course of Fr. Curso's pastorate, he had invited the RVM Sisters to get involved in Our Lady of Mercy parish. Sr. Olive Kingsbury, RVM was sent by her Congregation. As Parish Sister she takes charge of Baptismal Preparation, Marriage Preparation, Coordinator of Renew 2000 and other parish programs. In August, 1997 Sr. Nicolina Estevez, RVM joined her and taught first grade for two years at OLM school. Then in May 1999, Sr. Margie Aguilar, RVM joined them and served as Assistant to the Director of Religious Education in the Parish. A year later, Sr. Margie was assigned as Director of Religious Education Program of the parish. Perhaps Fr. Brown will be best remembered for his wonderful homilies. From the time he started in OLM, he has continually captivated the OLM community with his sermons that he always started with a segment from his early youth which he then articulately transformed and masterfully blended into that day's gospel message. Everyone loved them because the poignant stories were down-to-earth and the message was always clearly delivered. He was a great communicator, oral and written, and his daily emails to parishioners and staff were always delightful to read. He was kind, sensitive, understanding and intelligent (you could talk to him about anything) . He was very open and welcomed conversation. He was always there when you needed him. He had a daily open appointment calendar for anyone who wished to speak with him. And he never missed an appointment. He was a caring Pastor and was very generous in showering everyone with God's blessings. He often said phrases like, "God bless Nino", "God loves Nena" and "Thank God for Sister Fe". He treasured the people near to him and always referred to his staff as "gold". He never failed to recognize the good work that the sisters did at the church and never failed to thank everyone who helped in the preparation and celebration of the mass - the choir, the lectors, the altar servers, the eucharistic ministers and the ushers. Throughout the year, he scheduled dinners at the rectory with the various ministry groups and yearly, there was always the annual dinner for volunteers held at the church hall. Being a convert himself, Fr.Brown strongly supported the RCIA program, which helps candidates to learn the catholic teachings and prepare throughout the year and culminates in their acceptance into the Catholic community on Easter. He also encouraged youth ministry, grief support ministry and other ministries, and he welcomed the introduction of the Simbang Gabi masses before Christmas. Fr. Brown did not want OLM to be left behind by the advancement of Internet and technology, so he introduced the concept of online giving through electronic contribution to OLM. He always made sure that our webpage was updated to reflect interesting links to news, retreats, articles relating to being Catholic in the Internet Age. Father Bill was supportive and committed to Catholic Education and in particular Our Lady of Mercy School. made all these renovations: remodeled the church hall and kitchen; replaced the roofs and windows in the Rectory, Church, and Parish Center; remodeled sacristy and bathrooms in the church and refurbished the confessionals with face-to-face option; resurfaced the school yards and Parish parking lot; remodeled the guest room and kitchen in the Parish Center; and remodeled the apartment under the Kindergarten for new school principal. In gratitude and in fairness to Fr. Brown's expertise in languages, OLM is honored to say, "Father Brown, Thank you! Danke! Merci! Cảm ơn ông! Grazie, Arigato! Go raibh maith agat! Gracias! Mahalo! Salamat po!" See Parish Mission and Vision. At its beginning Fr. Power said, "Our parish was established for the convenience of all of us. In the truest sense of the word, we are all Christian pioneers. Every successful parish is built upon the united sacrifice of its members. In years to come you will be able to gaze upon your parish plant with pride and admiration, and you will be able to share its everlasting glory." We have the challenge through our exercise of membership, ownership and participation to carry on this fine tradition that is "SECOND TO NONE" in our day and for our future. We are Our Lady of Mercy W E S T LAKE and we must continue to work for the formation, growth, financing and development of this community VISION.